As I said in a previous post, I've been looking into updating the look of my bike a bit. I decided to try a set of shroud graphics for a 2002 CR and retrofit them onto my 2001 model. The 2002 graphics were more readily available and a bit cheaper, but I also like the look of them better and knew that unless I was going to switch over to the stock red plastics neither set would really look right without some modification. I wasn't prepared to spend the dough on new plastics and I'm still a little partial to the white. I'm also a little weird when it comes to wanting a certain look. I just don't quite like the stock look and I always have to be a little different. The lower graphic is the "stock" 2001 graphic made by FX. To make the 2002 graphic work, I cut the black sections into separate pieces and spread them out..kind of like an exploded look I guess. I think it made it look better on the white by spreading them out this way and it allowed me to at least line up the lower hole. By doing this, I was able to start with the bottom, then the top piece, then I filled in the middle with the other 2 pieces to get the right spacing. 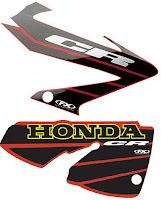 I also have the FX Honda swingarm graphics that look killer as well. Still to go are a new black rear fender with a fender decal to break up the solid black. It should blend well and the black won't get as discolored by the exhaust as the white has making it a PITA to keep clean! I really like the look so far, and I was able to save the money I saved on expensive graphics and plastics for a top end rebuild(more to come on this). By the way, I do think the graphic I got in the mail was a bit different than the picture, but it didn't matter in this case. I actually like the one I got just fine. I think it has a bit more red and the tip doesn't swoop back. Also, since I have an aftermarket white tank the white plastics blend the tank in better than red shrouds would. Stay tuned, I think the rear fender is really going to finish the look! Looks cool dude! Did you ever work on the top end you were talking about yet? Thanks. Not yet. I have a new piston, now I need to re-measure the cylinder and determine if it needs to be re-lined. I'm pretty much planning on re-lining it since the last time I measured, it was REALLY close to being under tolerance. I'll get to it after Christmas. I will be rebuilding the rear shock etc. too. Sweet. Get it done before Spring, you need to come down here in Ephraim with your trailer and all of your toys. I don't think they closed down Black Hill yet or maybe they won't. I can ride my bike up there and show you all the singletrack trails which all the moto dudes made down here. Dude, why not camp at Cane Valley? Cool, I'll get the bike done in January. Maybe we could head down that way sometime, have to see what the snow level does in the spring. I'd like to see those trails. Are there places to camp in Cane Valley? Seems like it's all farmland. We could park the trailer in front of the house though too. Cool. You could usually start riding on Black Hill area late Feb./early March. That's what I did last Spring. Depends on how much it snows in the winter though. To camp, you know that area where they have fathers and sons outing every year? Right by where the Sheep Trail starts when going up it? It's right by that pond and stuff. Anyways, mom would probably have you at the house anyway so she can see you more or whatever. Anyways, I can't wait 'til I ride my new bike at Black Hill next March! Looking forward to it! It's a perfect place for spring riding! nice look ! i like it actually i am also thinking to buy a yamha bike but its have no so good milize so what you think for best milize bike . Thanks!, I like the Yamaha bikes too..not sure what a "milize" is though. Nice update, Your bike look good. Its cool. I want to ride like that too.